It was a beautiful but blustery evening – hence, no need for wind machines on this catwalk to add flounce and flair to the fashions as Mother Nature got that detail down. The rest of the details – and there were many – from a requisite high-volume, heavy-bass sound system, crowds of spectators, and gorgeous models to the inspired clothing collections of burgeoning designers were handled to great success by student groups, the National Retail Federation Student Association and the American Association of Textile Chemists and Colorists. “Revolution,” the inaugural fashion event of the newly formed student clubs affiliated with the Merchandising Management and Design & Innovation Management majors at the college, featured the work of talented designers, and tapped into the edgy, global mood of change, sustainability and future uncertainty. 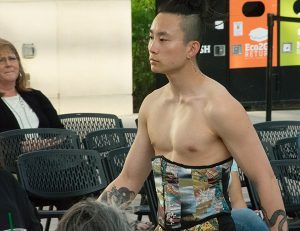 The first part of the show welcomed the talents of student designers from across OSU campus featuring “upcycled” garments constructed from discarded items, e.g., plastic bags, a Swiss military sleeping bag, old denim, fabric found in a dumpster, etc. The second segment showcased the College of Business’ Apparel Design majors, and featured truly unique to OSU, unique to Oregon inspirations. Where else in the world will you see a wedding dress designed from waterproof material? Go Beavs! The show, which created a space for each designer’s unique point of view, told a story that encompassed power, equality, and self-worth. 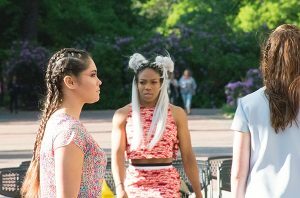 Five designers ventured into the dystopian space of upcycled fashion; six submitted a single garment, and apparel design program students created seventeen collections. The results – bright neon blocks of color, brave necklines, a patchwork of unique details and fabrics, complex paired with comfortable – came together in a long parade of stunning designs. Bravo, brava, bravi! A great shout out to the designers, models, members of both organizations AATCC and NRFSA, faculty, the Memorial Union and Student Experience Center for their contributions and outstanding performance.